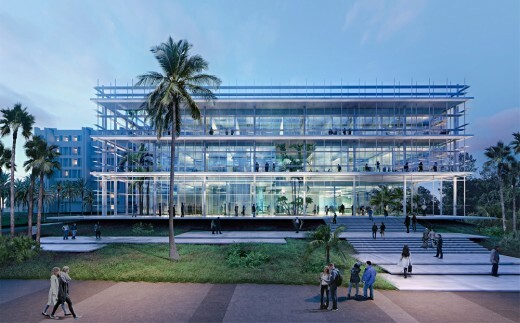 Tel Aviv University has chosen the winning project of the Open International Competition for the new Nanoscience and Nanotechnology Centre. 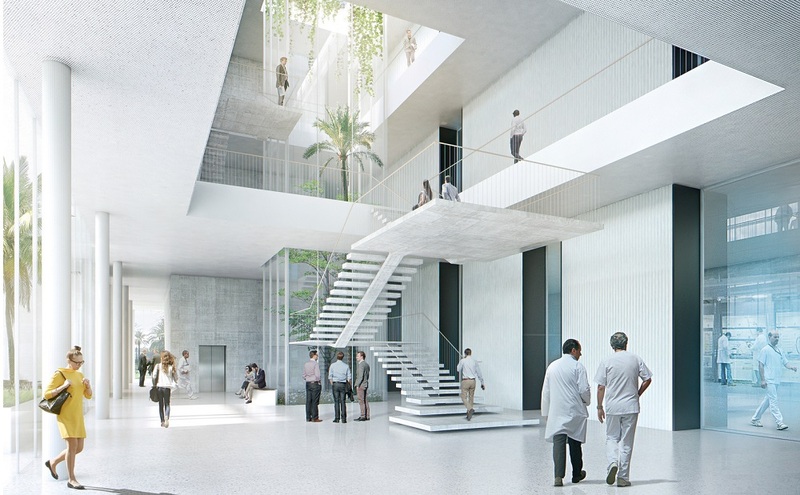 The project of French studio Atelier d’Architecture Michel Remon famous for its works for research centers in France was selected as a result. 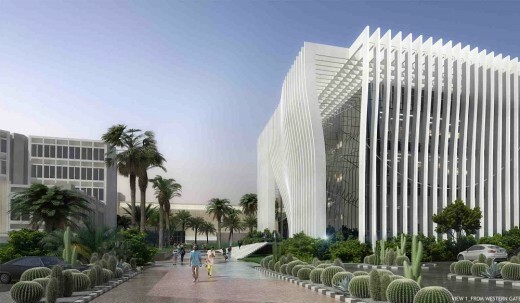 One of the most technological and cutting-edge buildings in the Middle East will be completed by 2020. The other two architectural companies were Jestico+Whiles Associates (UK) and Zarhy+Pez (Israel/Switzerland). 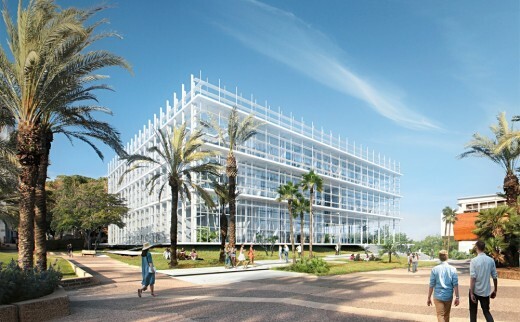 According to Tel Aviv University, the proposal of Atelier d’Architecture Michel Remon fits the local context and identity of Tel Aviv and the University campus and reflects the advanced progress in science, technology and innovation, which is very important for the new center and for the spirit of the Tel Aviv Campus. The final decision was made after a 6-month selection process, with the winner chosen from 128 applicants from around the world. “The final choice of the Nano building reflects the synergy between the technical needs defined by the research teams and our desire to provide an open and welcoming research environment. I have no doubt that the new building will help inspire outstanding research and global collaborations”. “We chose this competition because we like to challenge areas where science meets human endeavor and progress. And nanoscience and nanotechnologies are one of the humanity’s greatest endeavors. The most interesting and challenging aspect of this project was to design a very technical building specifically for scientific research while keeping a strong and iconic architecture dedicated to the Tel Aviv University campus”. Atelier d’Architecture Michel Remon has considerable experience in designing projects for technological buildings: the studio developed a project for the National Research Centre for Scientific Research (Meudon, suburb of Paris), the Physics and Biology Laboratories for Ecole Polytechnique (Palaiseau, suburb of Paris), the National Solar Energy Institute (Savoy), the Paris-Saclay Research Сentre of Air Liquide. 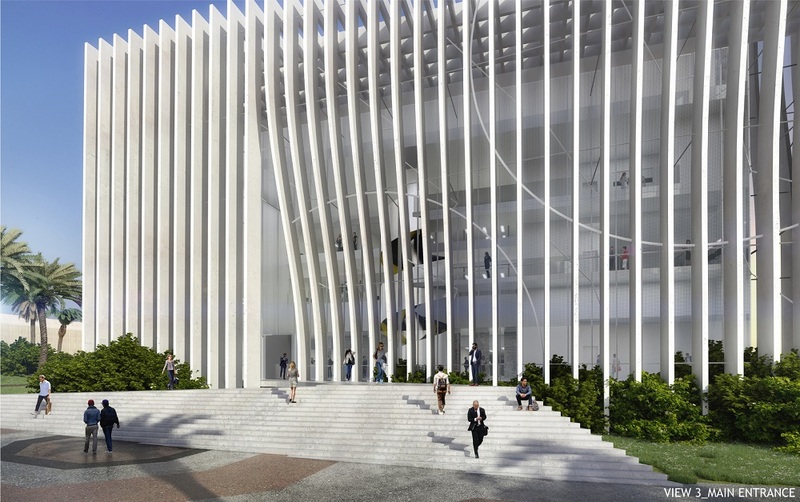 The project for Tel Aviv University presents a matrix of vertical lines creating a “skin” covering the three-storey building. The structure will enable natural light control and balance out the interior-exterior ratio. Visually, the building will not feature windows or doors. Among the energy efficiency solutions suggested by the company is special glass to optimize sun energy, natural ventilation, solar panels to cool the building and a rainwater collection system. The building has an area of 6000 sq. m and it is planned to be completed by 2020. The competition consisted of a prequalification stage and two main stages. The prequalification stage, which was completed at the end of October, required the applicants to submit application forms and send their portfolios. 128 application forms were submitted at the prequalification stage. 21 applicants were selected to proceed to the first stage of the competition. They presented the work of their companies and project development strategies via Skype interviews. As a result, six out of 21 participants from around the world were selected for design proposals. Each of the six participants received a 50 thousand dollar grant. The final presentation took place on February 26 2016. The six participants who presented their architectural concepts for the centre were: Elemental S&A; (Chile) in consortium with Schlaich Bergermann Partner, Jestico+Whiles Associates (UK) in consortium with CH2M, Ramboll UK Limited and Bruce Shaw, Office of Architecture in Barcelona (Spain), Atelier d’Architecture Michel Remon (France) consortium WSP France, Why (US), Zarhy+Pez (Israel/Switzerland) consortium RAPP Building Technology Ltd. и S.Ben Avraham Engineering Ltd. The participants were selected in November. On March 30 the jury selected three finalists from the six participants. The three finalists of the competition were: Zarhy+StudioPEZ Architects, Jestico+Whiles+Associates, and Atelier d’Architecture Michel Remon. According to the Competition Rules, the University initiated private negotiations with the three finalists followed by the announcement of the winner by May 1st. The competition launched on October 12 2015 and was organized by the Strelka KB Competition Department. 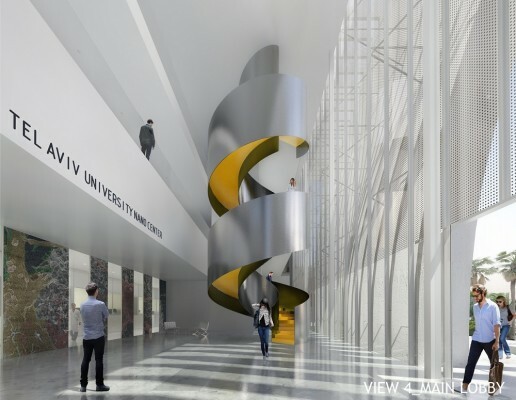 The new laboratory building will become a working space for over 120 scientists and engineers who will collaborate with one of the most significant universities in Israel. 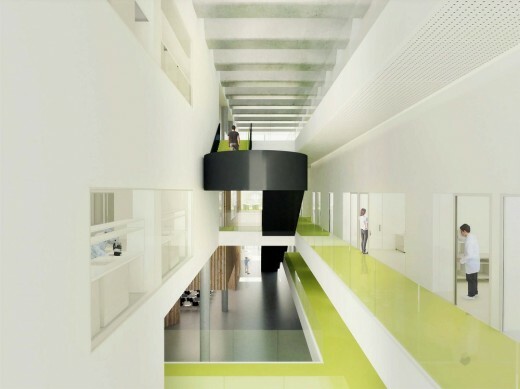 According to the technical report, 12 research labs will be situated on three floors: physical, biophysical, neural engineering, molecular electronics and other labs, as well as office and public areas. Exceedingly high requirements for design strategies are the unique feature of this project. Some laboratories require complete design accuracy: construction errors must not exceed 1 mm for every 100 sq. m. Moreover, a typical laboratory consumes five times more water and energy per sq. m. than offices and houses. That is why energy efficiency and engineering solutions are of significant importance in this project. Equally important is the fact that Tel Aviv University is a unique open-air museum of contemporary architecture and plastic arts created during the last five decades. The campus is significant for both its architecture and art installations that have been realized throughout its history. It was designed according to the principles of the Bauhaus in the early 1960s as a strict geometry of rectangular slabs and simple faculty and laboratory buildings. The company was founded in 1984 in Paris by a graduate of l’École des Beaux-arts, Michel Rémon. Nowadays, more than 40 employees work here, including 35 architects. The studio carries out large and complex projects, including hospitals, stadiums, universities, research laboratories, offices and infrastructures. Among these are the National Institute of Solar Energy (INES) at Chambéry, the Reims Stadium, the hospital site at Villeneuve-Saint-Georges and the Édouard-Herriot Hospital in Lyon etc. Michel Remon is a titular member of the French Academy of Architecture and a recipient of a Medal of Honour from the French Academy of Architecture. Strelka KB is a strategic urban planning consultancy and organizes architectural and urban planning competitions. The Moscow-based company consults government agencies, non-commercial organizations in Russia and abroad, including UNESCO. Strelka KB participates in developing public spaces, museums, social, educational and cultural projects. To respond to the complex and technical brief, we imagined a building of great simplicity. massing and external appearance of nearby buildings. as a geometric landscape creating by ondulations on the surface. This second skin is also a load-bearing exoskeleton and a means to control sunlight and relationship between the inside and the outside. This shape expresses a building dedicated to what is infinitely small, dedicated to future. A precise geometry making a iconic architecture beyond scale. The proposal adopts a strategic way to allow for future changes to be made. Based on a “modular principle”, structure and internal spaces layout are generic. The proposal wraps the laboratories into a unique perimeter loop corridor. Rather than a rigid plan, this organization provides independent access to each laboratory thought any plausible combinations. It’s built as a factory for research. The new building intends to be a functional working space that provides a stimulating environment fit to combine concentration on research with informal encounters and communication. The design of the building will respect the characteristics specified for various spaces with different types of activities. Offices and public spaces will be provided with natural light and direct views to the outside, while laboratories will be be protected from sunrays. The proposal provides two major technical entities in the basement and in the technical floor on the roof hidden behind the grid. Museum of Jewish Diaspora and the Steinhardt Museum of Natural History. It enables the extension of the TAU campus in adherance to the existing urban plan. This premise defines the building location and ground occupation, in an attempt to release a new East Entrance. The new building will act as a gate or outpost-building to the campus from the zoological and botanical garden and will create the first impression of the university. movement that echoes the wind flow. below, according to the brief. The overall winner will be announced on May 1, 2016. 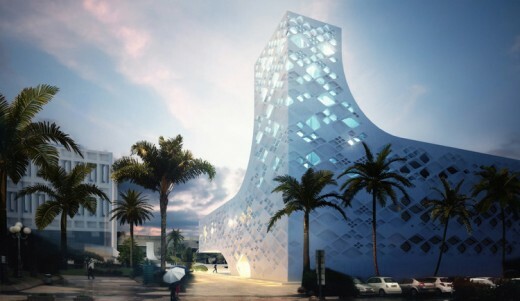 It gives me great pleasure to announce the international Competition for the selection of the Architect for the new Nano Building to be constructed at Tel Aviv University. 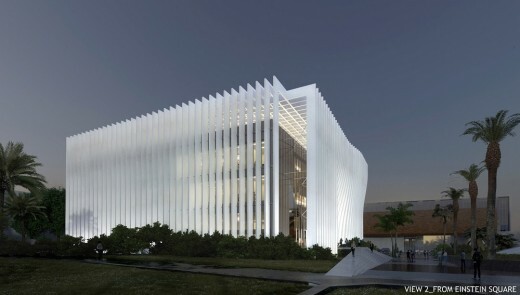 The designated Building will house Tel Aviv University Center for Nanoscience and Nanotechnology. Today, more than ever, institutions serving the national prerequisites of the country, need to be more creative and more advanced in science, technology and innovation, and the main goal of the Architect will be to provide the best solution for a special building project that will be sustainable both in concept and construction. Tel Aviv University has already acquired a global reputation through its research and cooperation projects in in the sphere of nanoscience and the centralization of all its academic and research efforts under one roof and one building will represent an important step in achieving our goals. I look forward to the selection of the best team and the best plan, and towards the construction of a unique building, representing the synthesis of creativity and practicality. Functional program is subject to modification. The detailed program will be delivered to the 6 Competition Participants (not later than 21 December 2015). The new building at TAU Center for nanoscience and nanotechnology will host a major nanofabrication and characterization laboratory and 12 core research laboratories. All together about 120 engineers and researchers will use the building as their main hub and spend vast amounts of their time in the building. Researchers at the Centre perform some of their work alone but many hours are spent in discussions and debates. Therefore the building should not only feature open spaces, but also private ones for confidential discussions with industry officials. While the building will host state of the art laboratories designed for performing cutting edge research, it should also allow the general public (visitors, high school students) to visit and to have a glimpse at the activity. Consequently, the building should be adapted to the visit of outside users including about 50 students coming to work in the central laboratories and about 40 engineers from the industry using the cleanroom facilities. Construction budget* — 25 000 000 US DOLLARS (incl. a maximum of 10% of the price of the Design Contract). * Constructions cost will be determined based on the cost of the construction of the Facility finished to FIT OUT. FIT OUT of a building implies building and assembly works within the Site boundaries, equipping the Object with on-site utilities and services, facade works, interior finish and further site development, including all the materials required to complete the construction and cost of design works. KB Strelka is a strategic consultant on the development of urban solutions and the leading Russian operator of architectural and urban planning competitions. The competitions of KB Strelka have witnessed the participation of over a thousand professionals in the fields of architecture, urban planning and landscape design from all over the world. Particular examples of such projects include the organization of the competitions for Zaryadye Park, the National Centre for Contemporary Art, the Museum and Educational Centre at the Polytechnic Museum and Moscow State Lomonosov University, the International Finance Centre at Rublyovo-Arkhangelskoye, the new Solntsevo and Novo-peredelkino Metro stations, the design for the Irkutsk Smart School, and others. KB Strelka’s authority is founded on the transparency and well- reasoned nature of its procedures, which ensure the highest quality of winning projects and teams. These projects correspond to the aim and objectives of clients, the criteria of the expert community and the expectations of ordinary citizens alike. The campus itself is a unique open air museum of modern architecture and plastic arts spanning the past five decades. The design for the new Nanoscience and Nanotechnology Center should reflect the beauty and integrate the functionality of all the buildings that make up the campus. At the same time it has to embody the spirit of this University that is nothing less than a national symbol. The new building will host a major nanofabrication and characterization laboratory and 12 core research laboratories. Altogether about 120 engineers and researchers will use the building as their main hub. 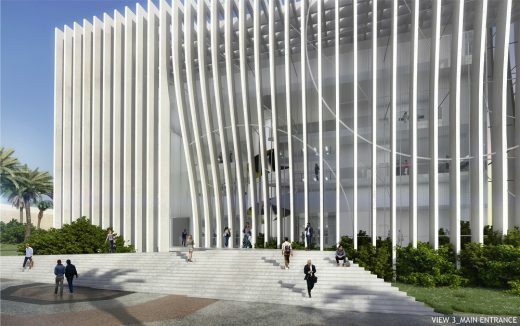 The subject of the Competition is the architectural Concept for the new Nanoscience and Nanotechnology Center to be located at the Tel Aviv University Campus. The architectural Concept encompasses the general urban development, architectural, planning and spatial solution for the Project Site and the Facility. The purpose of the Competition is to choose, based on a comparison of the Architectural Concepts submitted, the 3 (three) ranked Finalists and further select the Winner to be engaged for the preparation of the design documentation with respect to the Facility and the Project Site. The Competition is organised into two phases as an open call Competition with pre-selected qualified Applicants. During the pre-selection phase, the Jury will select 21 (twenty one) Applicants who will engage in competitive dialogue during the first phase. At the end of the first phase, 6 (six) Participants will be chosen to further develop architectural Concepts during the second phase. At the end of the second phase, the Jury will rank the three Finalists and eventually decide on a Winner after deliberation with each of them. Participation is open to design bureaus and consortiums of companies comprising specialists in the fields of: architectural design, engineering systems and evaluation of design and construction costs. The Competition is global and no restrictions apply concerning the applicant’s country of origin. Each of 6 (six) Participants chosen after first Jury meeting will get an honorarium of 50,000.00 US Dollars (excluding VAT, if applicable). The said amount shall include, in particular, a compensation for the Participant’s financial and labour costs incurred due to preparing and presenting the Competition Proposal. Exclusive rights to architectural Concepts belong to the Participants and are not automatically obtained by TAU as part of the Competition procedure. TAU receives the publication rights for the architectural Concepts.